The NVIDIA GTX 200 Series Is Out! When the ATI Radeon HD 4850 was scheduled to be launched on June 18, NVIDIA decided to spoilt their party by scheduling the launch of their new GTX 200 series of graphics cards a day earlier. Then ATI decided not to play the game and delayed their launch to June 25. Now that there was no reason to launch on June 17, NVIDIA apparently decided to speed up the launch, by one day to June 16. Well, today's the day NVIDIA officially launches their GTX 200 series of graphics card! Although many of us have already read about and even seen photos of the two new NVIDIA GTX 280 and GTX 260 graphics cards, today is the day we can finally tell you the whole story about the two cards. Yes, we behaved like gentlemen and we kept to our NDAs, even though their spy really pissed us off. Alright, now that everything's in the open now, let's get onto the good stuff - the new NVIDIA GT200 GPU and the two new NVIDIA GTX 280 and NVIDIA GTX 260 graphics cards. The nomenclature is a bit confusing, so forgive us if we do make any mistakes here. Both the GTX 280 and the GTX 260 are based on the NVIDIA GT200 GPU, although there are some who call it the GTX200. I guess it could be used interchangeably although it would be more accurate to call the GPU, GT200 and the card series, GTX 200. In any case, the new NVIDIA GT200 has 240 stream processors (or processing cores), which generate about 933 gigaFLOPs of processing power. 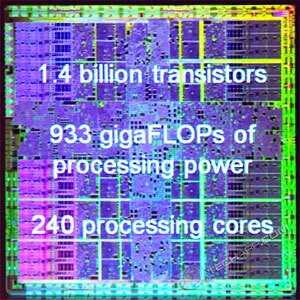 To achieve that requires a lot of transistors - an astounding total of 1.4 billion transistors. This, plus the fact that it is still built on the 65 nm process technology, inevitably meant the GT200 would be a very large chip. With a die size of 575 mm2, it is approximately 5x the size of an Intel Core 2 Duo E8400 processor. Windows Server 2008 Service Pack 2 Details Leaked! How To Always Save Tab Session In Internet Explorer 7?